Hi! We’re the Spats and we’re f*ckin’ nuts! This has to be super quick since it’s being done days in advance due to an unexpectedly overbooked schedule that involved a few days traveling when I oughta shoulda been taking care of other life stuff (like the blogs and such). That said, we last talked about the Spats back in February with their garage stomper ‘She Done Moved’. 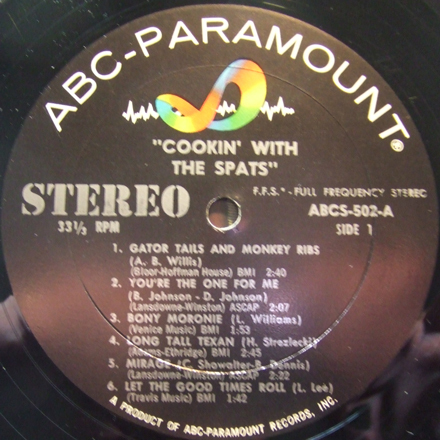 Not long after that post I managed to score a copy of their earlier ABC album ‘Cookin’ With the Spats’ which featured the stuff that first got them on TV, like ‘Gator Tails and Monkey Ribs’. It’s a cool album in a somewhat clean-cut take on the frat rock sound, but there was one marked exception, that being the tune I bring you today, their fast-paced and more importantly unhinged take on Larry Williams’ ‘Boney Moronie’. I’ve heard countless covers of this tune (I even have another one in storage for future posting) but the Spats really take the cake, if in fact the cake in question was made with crushed pep pills and rocket fuel in the batter. It’s just under two minutes of crazygonuts, which is about all I have time for. The new week has arrived and so have some new sounds. I hope everyone had a chance to tune in (aka pull down the ones and zeros) to the latest Iron Leg Radio Show. If not it will be available in the ILRS Archive (just click the link in the header). 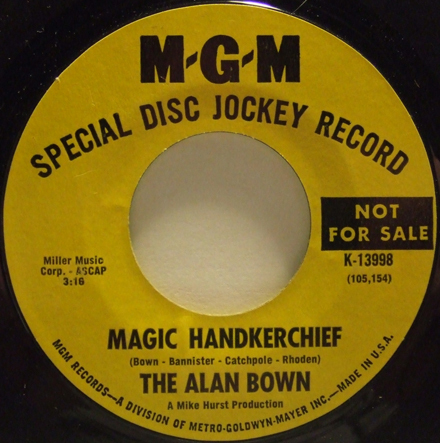 I grabbed today’s selection – unheard – off of a friend’s sale list sometime last year, mainly on the strength of the fact that I’d known the name Alan Bown for decades, seen records at record shows but never really delved into their oeuvre. The titles looked suitably mid-60s-ish (especially today’s selection) so I grabbed it for less than a tenner and reeled it in. Upon the first needle drop (on the A-side ‘We Can Help You’) I realized that my placement on the timeline was correct, but that the song in question, though wholly Rubble-y, was a tiny bit too treacle-y for my tastes. That said, as soon as I flipped the record over my small amount of buyer’s remorse disappeared forthwith. The b-side ‘Magic Handkerchief’ was a slightly harder-edged selection with a bit of that psyche on the road to prog flavor and with just a soupcon of soulful horns. As it turns out, this was likely a reach backward for the band led by Alan Bown (not to be confused with Andy Bown of the Herd), named variously the Alan Bown Set (in their early R&B days) or The Alan Bown, and utterly confusing but wholly appropriate for the time and place. As the Alan Bown Set they recorded R&B/soul material like ‘Emergency 999’ and their (quite good) cover of Edwin Starr’s ‘Headline News’ in 1966. Bown was a trumpeter, and the vocalist on ‘Magic Handkerchief’, doing a very Robin Gibb-ish turn, is Jess Rhoden (later to be replaced by a young Robert Palmer). The more I listen to this track the more I find to like. It certainly has the a-side beat in terms of toughness and general quality, though it is understandable why the poppier ‘We Can Help You’ (a cover of a tune by Nirvana) was a minor hit in the UK in 1968. In an interesting bit of trivia, Alan Bown saxophonist John Helliwell later joined Supertramp. As hard as it may be to believe, it’s already time for the third installment of the Iron Leg Radio Show. This time out there’s all kinds of groovy ish, from the psyche, to the garage, to vaguely almost kinda prog, to cool stuff from Brazil, freakbeat, Moog and the cusp of heavyosity, all delivered with the kind of sub-Wolfman Jack-ery that you’ve come to expect during the three months that this has been going on. If you dig what I’m doing here (or not, heaven forfend…) , take a moment to drop me a line. Requests are welcomed (as long as I have it I’ll play it) and while we’re on the subject, should you also dig the sounds of soul, you might want to skip over to the mothership, aka the Funky16Corners blog and click on the F16C Radio Show tab to pull down the ones and zeros on episodes of the long-running show of the same name that airs every Friday night at 9PM on Viva Radio. That said, I hope you dig the show, and I’ll be back next week with something cool. Unchained Mynds and their Sears portrait! It’s a new week a-dawning here at the old leg of iron, and I have something cool for you (natch). The tune in question is a cover of one of my favorite equal-opportunity soul records, Wayne Cochran’s ‘Going Back to Miami’, which taken in its original form is enough to blow the hair right out of your scalp and send you into what the old timers used to refer to as conniptions. 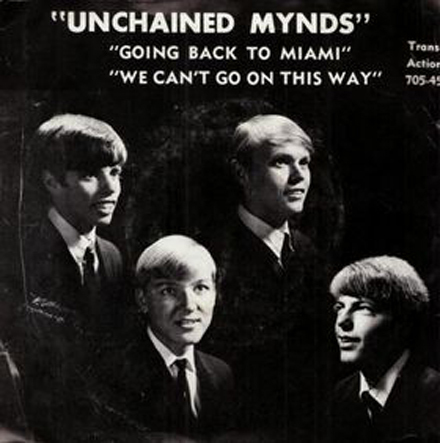 When I found the 45 that includes today’s selection, I had no idea who the Unchained Mynds were (though my 60s punk radar was set off instantly by the deliberate misspelling of the second half of their name). However this mattered not a whit since the combo of 60s punk and Wayne Cochran cover was too much to resist so I forked over the dough and took it home. As it turns out, the Unchained Mynds were the pride of LaCrosse, WI. They recorded a couple of 45s for the local Teen Town and Trans Action labels, had one picked up (this one in fact) for national distribution by Buddah, and then released one more on that label (all between 1967 and 1969). Their initial waxing was a cover of Traffic’s ‘Hole In My Shoe’, which you can scope out over at The Devil’s Music. 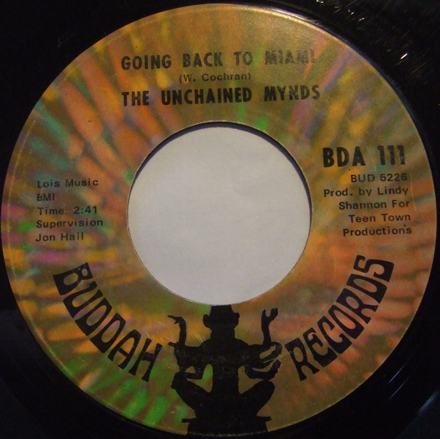 Today’s killer, their take on ‘Going Back to Miami’ is a raucous bit of teen lunacy that sounds like the bunch on that picture sleeve above got into some grain alcohol and a case of Sir Douglas Quintet 45s and the resulting explosion produced this record. 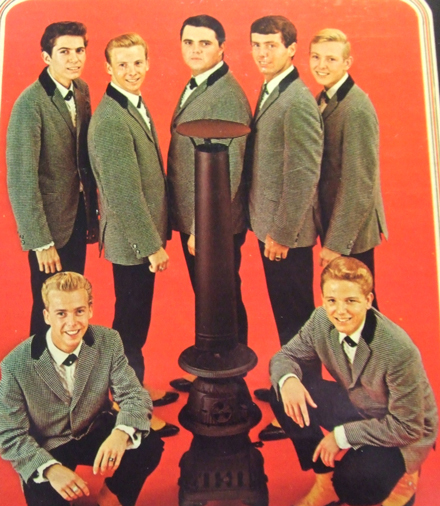 The flip side is a mawkish take on Teddy and the Pandas’ slightly less mawkish 1966 ‘We Can’t Go On This Way’ that sounds every bit like the band apologizing to their parents for the A-side. It’s a nasty little banger and I hope you dig it. I hope all is groovy in your neck of the woods. The tune I bring you today is one of those records that kind of bubbled up from inside my collection in a way that I can’t even remember where I got it. Aside from the fact that it is clearly an indicator that I buy way too many records (yes, the first step is admitting you have a problem….My name is Larry and I have a vinyl monkey on my back and in my wallet), but sometimes I get said records in clumps, i.e. via a “lot” purchase and don’t always get the time to examine the fruits of such a purchase as closely as I’d like. As a result, when a spare hour or two pops up, I wade into the stacks and start giving these records a spin in an effort to dig up undiscovered gold and to pare down the piles of wax, of only a little bit at a time. 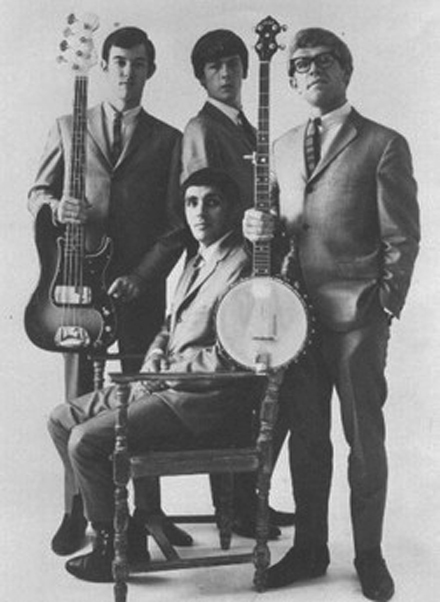 That said, for years the Modern Folk Quartet were little more than a name to me, eventually evolving into a stack of footnotes, with the group being the starting point for folks like Jerry Yester, Chip Douglas and uber LA-scene photographer Henry Diltz. They recorded a couple of folkie albums for Warner Brothers in 1963 and 1964 and then some non-LP 45s for WB and Dunhill. It was during the 45-only period that their sound started to evolve and got a little less purely folk and a little bit more folk rock. I haven’t been able to date the 45 that gives us today’s track, but I’m making an educated guess that it was issued some time in 1965 or early 1966 (the year the group broke up). 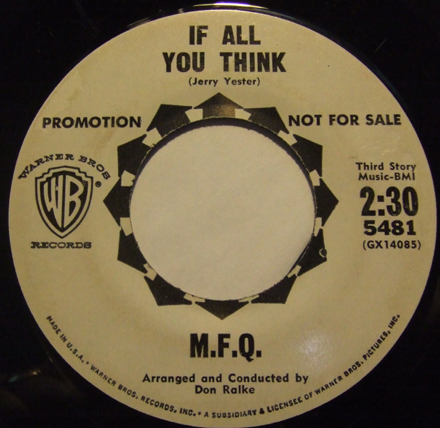 ‘If All You Think’ is a very groovy bit of jangle that has that west coast 65/66, Beau Brummels/Nitty Gritty Dirt Band feel to it, with 12-string guitar, tight group harmonies and just enough “rock” in the foundation to move it from the coffee house on to the Sunset Strip. 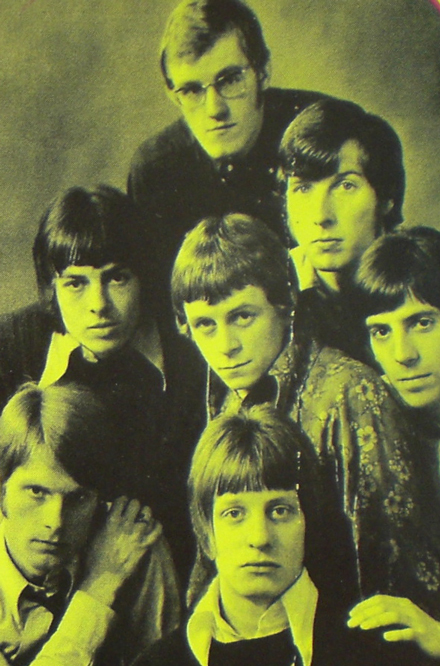 After the group split in 1966, Jerry Yester (whose brother Jim was in the Association) went on to join Judy Henske in recording the sought after freak folk/psych LP ‘Farewell Aldebaran’, Chip Douglas went on to a career as a studio musician recording with the Monkees among others, Cyrus Faryar had a career as a producer and performer, and Henry Diltz and his camera went on to capture some of the most memorable images of the Laurel Canyon rock world, including the covers of albums like the first Crosby Stills and Nash LP, the Doors ‘Morrison Hotel’ as well as countless famous images of CSNY, the Eagles and just about everyone else who ever entered a recording studio or trod a stage in LA.